Are you looking for hotels near Folkestone? This private day trip organized just for you and your party will take you to the charming UNESCO Heritage City of Canterbury and historic Leeds Castle. 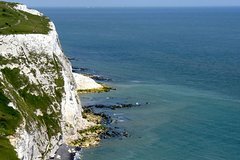 Transportation will be provided in a modern air-conditioned 7-seater vehicle with the services of a fully qualified driver-guide.This private excursion may start in Ashford (Kent), Folkestone or Dover and you may choose the preferred start time that suits you best. Participants travelling by High Speed train from London St Pancras will be met at Ashford International station. Those arriving by ferry or cruise ship may be picked up and returned to the Port of Dover at no extra charge. 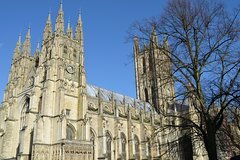 The duration of the excursion is between 4 to 5 hours, depending on how long the participants wish to spend at the stops.Enjoy a private walking tour through the historic main streets and hidden lanes of Canterbury, a UNESCO World Heritage Site. The highlight is without doubt the breath taking Cathedral, the mother church of the Anglican community. Driving west along the Stour Valley you pause in Chilham, a gem of a village that has featured in many period films. Time permitting, you may stop for a drink or even lunch in one of the splendid public houses that the village has to offer (own expense).The second part of the excursion takes you to Leeds Castle, quite rightly dubbed 'The Loveliest Castle in the World' (entrance ticket at own expense). Boasting over 1000 years of history, it was once the property of six of England's Queens and was used by Henry VIII and his 1st wife, Catherine of Aragon. The Castle itself rises dramatically from the waters of its moat and is surrounded by 500 acres of stunning parkland. Throughout history, it has been a palace to entertain and impress with every generation leaving its mark.At the end of the tour, you will be taken back to a location of your choice in either Canterbury, Ashford, Folkestone or Dover.